Company Partners Blog » How to market smarter. I spent an enjoyable couple of days doing one-to-ones on business planning at a conference last week and the area that was most misunderstood was the need to define and understand your market. It sounds simple, everyone of course understands their market don’t they, it’s obvious. The market is whoever will buy from us. We don’t want to restrict ourselves, so we will market to everyone. There are actually a couple of problems with that; firstly to market to everyone you have to spend a lot of money. Then think about the messages that your marketing is going to give, to be applicable to everyone they have to be fairly general and bland. This is where a well known but often ignored marketing technique comes in – market segmentation. You may well have a product or service that could be bought by a great many people, but they will not all be alike. They may live in different geographies, be of different ages or gender, or have different expectations of the product. The more you can focus your marketing effort the more cost effective your advertising is, instead of expensive adverts in large magazines to try and reach everyone, or GoogleAds covering lots of keywords, you can just pay for advertising in the specific media that your focused market reads. 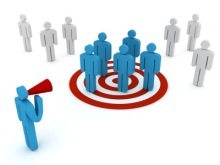 Importantly also, the messages and benefits that you give will be targeted exactly to that group of people. It may be that your company, works both for corporate clients and private individuals, each will value different aspects of your offering. A middle aged man will identify and be swayed by different messages about your product than a teenager. The more you can segment your market into different chunks, the more effective your advertising and marketing will be. Finally it may lead you to changing how your product or service is packaged to be more attractive to each specific group, rather than a one-size fits all, that no one sees as relevant to them. Good stuff Lawrence. I’d add that there are lots of ways of marketing without spending too much money, which is particularly useful if you are keeping an eye on cash burn. Also, choosing the right channel to market can be vital e.g. piggy-backing on system integrators with software products and deciding on whether to grant licences for patented ideas rather than develop one’s own products or services. Maybe a topic for future articles? I am a business student at uni in Reading and honestly, this is the most comprehensive and well explained justification of market segmentation I have seen. What’s more, it is practically applicable, not just waffling theory. Many organisations often ignore or miss the opportunity of finding out why their current customers bought from them. Whilst in many cases this could be reputation, quality of service, competitive pricing or a charm offensive from a good sales guy. But if you take the time to understand why a client has chosen you, it often uncovers other peer company opportunities and in my own experience a least two cases were we identified gaps in available business solution offerings that we were able to develop and exploit to generate many millions in licence and services revenues.